To mark the centennial of modern Zionism, Nira Harel has skilfully sketched the dramatic biography of the founder of Zionism, the visionary who foresaw the establishment of the Jewish State. The biography of Theodore Binyamin Ze’ev Herzl flows easily and is aptly tuned to a young readership. Facts and details are faithfully portrayed while the story remains fascinating and vivid, bringing this legendary figure to life. Young readers will undoubtedly be captivated by the exciting story of the man who fought single-handedly for his revolutionary ideals against all odds. Reading this moving biography and becoming better acquainted with the events which took place during Herzl’s lifetime gives his fiery statement “If you will it, it is no legend,” even greater meaning. A series of photographs of Herzl from the Central Zionist Archives in Jerusalem, some of which have rarely been published, as well as several famous caricatures add to the book's appeal. 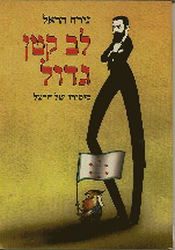 The book is illustrated with Avner Katz’s humorous and charming drawings.